Wrap a smooth thread base along hook shank leaving space at both front and back of hook. Remove thread. Cut a length of Float Foam slightly longer than hook shank. Make a slit in foam half the total foam depth. Cover thread wraps with a light coat of Zap-A-Gap and push foam down over hook shank into slit. Attach thread at rear of head and wrap down Float Foam tightly over about ¼ of total hook shank length. (This is the area covered with dubbing in the second image above.) The thread wraps will form a tight waist and provide a base for attaching the legs. Trim front of head and rear of abdomen at 45-degree angles. Cut two lengths of round rubber legs with four attached strands and make an overhand knot. Apply a drop of Zap-A-Gap to knot and allow to dry. When dry, separate the four strands below the knot down to 2 strands using a bodkin and cut off 2 strands. This makes a fat upper and a slim lower kicker leg. Attach kickers on each side of abdomen with several wraps of thread so that the legs extend rearward. Cut two lengths of rubber legging two strands wide and attach in X fashion in front of kicker legs. 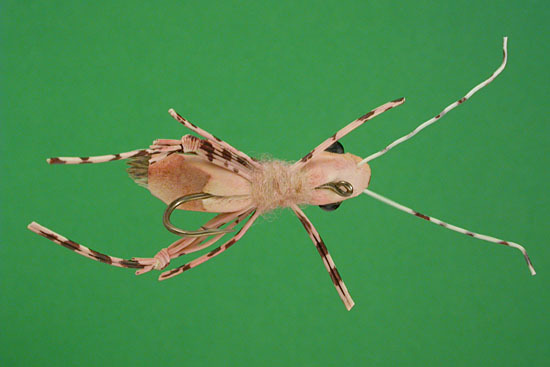 Lightly dub the tying thread with a fine dubbing and wrap over the tie in points for the legs concealing the thread. Attach the lacquered wing in front of the legs and cover the tie in with additional dubbing. Apply a fine coat of Zap-A-Gap to abdomen and press wing into it cementing the wing to abdomen. Whip-finish the thread at back of the head and apply a drop of Zap-A-Gap to final wraps pulling them into the dubbing and remove thread. Using a fine needle, insert one antenna into the eye of the needle and push the needle thru the back of the head at an angle out the front of the head. Slide needle off antenna and apply a small drop of Zap-A-Gap to the back end of antenna and pull into foam (careful, don’t pull the antenna all the way out the front). Repeat on other side. Zap-A-Gap an eye to each side of head using beads or run a length of mono thru the head at eye positions using a needle. Remove needle and melt the mono ends to form the eyes on each side. I don’t recommend using a lighter to do this as the foam has a low combustion temperature. Using a permanent marker pen (Pantone or Sharpie), mark the legs, antennae and head of the hopper. By tying in the legs tightly to the compressed foam, you will get a nice “splayed” leg effect for the kicker legs. The flexible rubber legs wiggle when the hopper is twitched on retrieve. 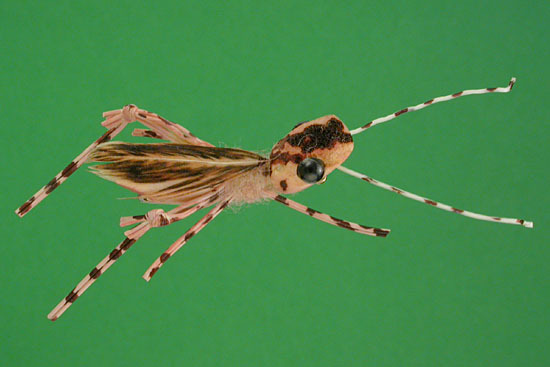 The high floating nature and silhouette of this hopper, coupled with the wiggling legs, causes some violent strikes. Try this pattern in black too.